Metered and unmetered taxis and autorickshaws are available for moving around the city. However the panoramas of Daman are best explored on foot. 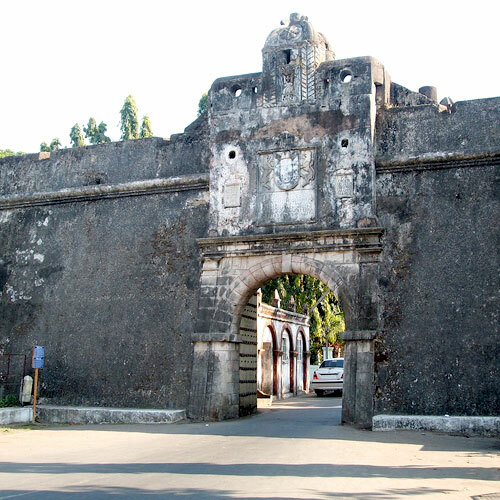 Moti Daman: This is one of the most visited structures in Daman, once home to the homes of the Portuguese. The most recognized structure here is the old Fort, which spots about 10 bastions and 2 gateways. The fort walls are quite mossy and a moat links the fort to the sea. Within the fort is the Iberian Church, Se Cathedral, which is a 17th century church with a gold-painted wooden altar. Depictions from the life and times of Christ adorn the walls. Of equal importance is the newly developed Hilsa Aquarium within the fort, where you can take a submarine boat ride and watch a large number of exotic fishes. Moti Daman also houses the Governor's Palace, which is worth watching for its highly carved stairway and ornate chandeliers. Daman's churches are also worth watching, the most impressive being the Church of Bom Jesus. Created in Portuguese architecture, it displays heavily ornate doors and ceilings. Similarly striking is the Our Lady of Rosary Church, which has attractive gothic architecture and a huge prayer hall with carved figures. Also catch a round of evening stroll at the Satya Sagar Udyan, which abounds in fountains, well-maintained walkways, a lake and restaurants and cafÃ©s serving regional delicacies. Nani Daman: Another prominent spot in Daman, Nani Daman's most recognized image is the St Jerome Fort or Fort of Nani Daman, as it is better known as. The fort has 3 bastions and 2 gateways, the bigger of which faces the river and has a life-like statue of St. Jerome. Also located within this fort is the Church of Our Lady of the Sea, which showcases a fine panel work. Another beautiful church located within the fort is the Lady of Remedios Church, which has a fine altar. Located close to the church is an old cemetery. Check out the Gandhi Park at Daman Jetty and the old Lighthouse, which is quite popular with children. One of Nani Daman's most enduring images is the Jain Temple, whose walls are decorated with glass murals depictions of Mahavira's life. Damanganga Tourist Complex: A popular haunt for families and couples, this complex is made of a cafeteria, health club, amphi-theatre, waterfalls, sports, fountains and island gardens. Daman's seaside location renders it the choicest of seafood, including fresh lobsters and prawns. Best known for these would be the Cidade de Daman's Bay View Restaurant, where you can choose your fish and recommend a cooking style to the chef. Other than seafood, they also cook up decent tandoori fares. Also worth trying would be the Sandy Resort, which offers a choice of Chinese, Mughlai, Punjabi and seafood. The hotel also has its own bar, which conjures up fine cocktails. Located on Devka Beach, Hotel Miramar is known for its South Indian breakfast, which includes a variety of dosas, idlis and vada-sambar. Hotel Jazira overlooks the Devka Beach and creates specialty seafood. It also offers a wide choice of Indian, Continental and Chinese cuisine. Located on Seaface Road, Hotel Sovereign has a multi-cuisine restaurant called Pithora, which serves special seafood and a choice of Indian and Continental cuisines. Located overlooking the beach, Dariya Darshan Hotel has a multi-cuisine restaurant, Feta ni Wadi. Its pomfret fry, tandoori chicken, paneer shahi and prawn butter fry are absolutely delectable. Definitely no shopping paradise, Daman offers limited shopping options. The usual knick-knacks are of course available - seashell earrings and necklaces, oyster artifacts, woven bamboo mats and baskets, stringy chappals, sarongs and t-shirts. The main shopping areas are Maharaja Super Market at Devka Beach and Nani Daman. There are a few options here mostly on the seafront. Hotel Brighton on MG Road is a sea facing hotel offering air conditioned rooms with a large number of amenities. A better option would the utterly luxurious Cidade De Daman, which offers beautifully furnished rooms overlooking the sea. Hotel Sovereign is another sea facing property situated close to the airport. The hotel has 23 well furnished rooms equipped with most business amenities. No matter when you plan your trip, make sure that you book well in advance, especially during holidays or on weekends. Air: Daman Airport is the closest to the city connected by regular flights to Mumbai. Alternately Mumbai Airport at 180 kms would be a better option since it is connected to more cities in India and abroad. Rail: Vapi, 10 kms, is the closest railhead, connected to Mumbai and Ahmedabad by daily trains. Unmetered taxis would take you to Daman from Vapi. Road: Daman is connected via NH8 to Bhilad, Damanganga River and Vapi.